The Chicago Blackhawks have played in five outdoor games, and we're recapping them all before they play in their sixth against the Boston Bruins this season. The Chicago Blackhawks will be competing in this year’s Winter Classic at Notre Dame Stadium, and on Friday the team revealed the logo it will be using for the big event. The circular logo isn’t a completely accurate representation of the 1920’s look, with the team’s modern-stylized Indian-head logo and the name “Blackhawks” as one word instead of the original two word styling of the nickname. There is no indication of whether the Blackhawks will use the black-and-white striped jerseys of that era when they hit the ice, but one would imagine there will be at least a subtle nod to the Notre Dame Fighting Irish when the look is revealed later this year. 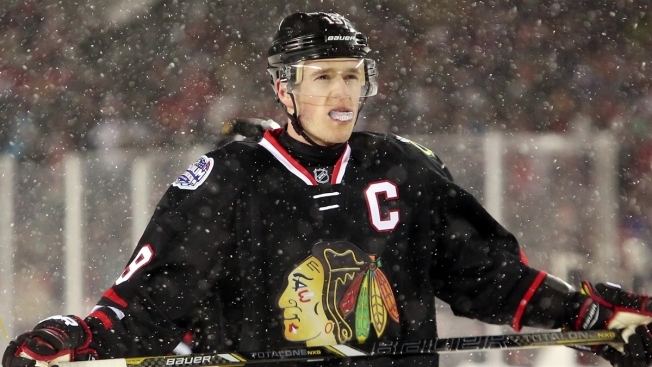 The Blackhawks have previously used designs from the 1940’s, which they wore during the 2009 Winter Classic at Wrigley Field, and from the late 1950’s with their 2017 jersey at the Winter Classic in St. Louis.